Electronic Switches offers pullcord siwtch which is used as a safety switch to stop the conveyor bwlt in case of any emergency. 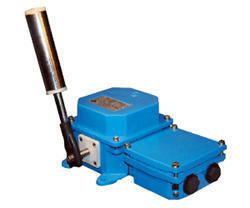 Electronic Switches offers belt sway switches for conveyor safety applications. It is used to detecte the sway/ or deviation of conveyor belt and sends out alarm signal or emergency signals to stop the conveyor. It is suited for belt breakage preventation and overfalling preventation due belt sway. The belt sway switch is desgined to allow over travel of actuating rollers and switching mechanism is isolated from mechincal actuating roller. Electronic Switches offers Belt Sway Switch which is used as a safety switch to stop the conveyor belt in case of any emergency. It is used as a safety switch to stop the conveyor belt in case of emergency. Pull Cord switch is mounted on the walkway side of the conveyor belt , preferably about every 20-25 meters. When the rope is pulled from any side, the switch gets operated. In Belt Conveyors, belt swaying occurs due to uneven loading, misalignments of the idlers and due to worn surfaces. Belt Sway switches are useful to restrict belt sway within the tolerable limits.